Location: On the slope above and west of the farmhouse. Random slate rubble, in which the gaps between the larger stones are filled in with smaller ones. Slate roof. Built against the slope, with opposed doors, each with steep rough voussoir arch. The space is unequally divided as 1-2 bays by the entrances. Single small vent in rear. Upper entry with rough timber lintel in the W gable wall. Slate threshing floor. Rough queen strutt trusses, with ridge and 2 purlins, set into the wall below the present wall plate. 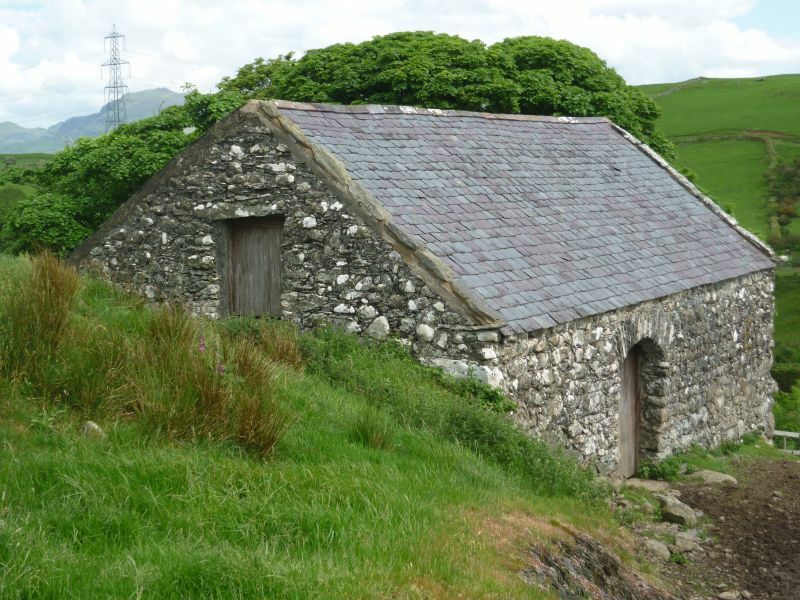 An excellent example of a late C17 threshing barn which survives virtually unaltered. 2km approx. NE of Criccieth, set back to the N of a lane running W from the N of Pentrefelin. Towards the top of the lane approx. 1.5km out of Criccieth, below the golf club house. The house lies at the end of a farm road leading off the minor Pentrefelin to Dolbenmaen road, and N of Pentrefelin village.